Before I begin, I’d like to thank David Horowitz for graciously providing me with a copy of the manuscript for Indoctrination U: The Left’s War Against Academic Freedom ($14.93 at Amazon; excerpt available here), without which I would not have been able to write this review. It was his stated wish that I read his argument in order to more accurately engage with his ideas, which I found a reasonable request. Professor Horowitz is welcome to respond to this post, either here or at his own website, FrontPage Magazine, and I’ll be happy to offer him equal time at ProgressiveHistorians. Now — to the book. Indoctrination U is the type of volume that makes you feel as if you’ve somehow missed the earlier and more important part of the discussion. Horowitz’s trenchant arguments against what he terms “the use of classrooms for political agendas” are muted by his bizarre decision to frame the book as a discussion of attacks on his own character and earlier works. Despite this unfortunate choice, Horowitz raises a number of points worth discussing, and in certain cases makes a great deal more sense than his detractors ordinarily give him credit for. Let’s start with the good: Indoctrination U is an excellent and fast-paced read (I finished it in a single five-hour airplane flight), structured more as a narrative than as a scholarly text, but replete with footnotes that indicate Horowitz’s sources are generally sound. Though Horowitz’s main argument does not appear until the fourth and eponymously-titled chapter of Indoctrination U, he presents it articulately, methodically building a set of examples that should shock even jaded academics. …A democratic education should not force-feed students opinions on controversial issues that teachers deem “politically correct.” It should create citizens who are able to figure out what conclusions they wish to draw on their own. This is the idea that lies at the heart of the existing academic freedom provisions of virtually every university in America; the failure to observe these provisions is the crux of the educational crisis that the Academic Bill of Rights seeks to address. Once enrolled in the introductory class taught by the program’s director, Professor George Wolfe, student Mock discovered to his dismay that the class was a recruitment and training course in leftwing politics and anti-military attitudes. Without exception the course lectures and texts guided him and his classmates to views of America as an enemy of global peace, and to a sympathetic understanding of the terrorists who have attacked it. Among the “methods of achieving peace” recommended by Professor Wolfe was a menu of radical organizations that students were encouraged to join. These included PeaceWorkers, which is part of a coalition that includes the pro-terrorist Muslim Students Association and the Young Communist League and for which Professor Wolfe is the campus advisor. Students who traveled to Washington to oppose America’s efforts to topple Iraq’s dictatorship were given academic credit for doing so; students who supported their country had no similar opportunity. Ball State’s program isn’t the only example mentioned, nor are the most egregious instances of shameless professorial activism limited to “peace studies” programs. With rapier-like precision, Horowitz deftly excoriates a course on “Communications and Social Change” at the University of Texas whose only source texts are by the Marxists Howard Zinn and Robert Jensen; he similarly dissects a Women’s Studies curriculum at Kansas State whose stated purpose is to teach students to “apply a broad range of feminist perspectives and theories to their personal experiences, professional work, and to their understanding of society.” While this position may differ from that of many of my liberal peers, I agree with Horowitz that these most extreme examples clearly demonstrate a faculty attitude of assuming the answer to questions that are far from determined. In my opinion, state-run schools in particular should examine carefully whether their taxpayers are being well-served by curricula and courses that teach fealty to political opinions rather than critical thinking and emphasize one-sided activist manifestoes over broad-ranging literature. Such excuses do little to shield Horowitz from the criticism that he does not deal with left-wing professors in a reasonable or respectful way, instead frequently resorting to ad-hominem attacks on their character and denigrating their beliefs on the role of the academy by tarnishing their personal reputations. Horowitz employs such a method again in Indoctrination U in his discussion of Princeton’s Joan Wallach Scott, the former chair of the American Association of University Professors’ Committee on Academic Freedom and Tenure who has emerged as Horowitz’s chief nemesis. Scott is also a remarkable scholar whose writings on gender in American historical analysis are pathbreaking and of unimpeachable integrity (this coming from a political historian with no particular fondness for gender history). Despite Scott’s impeccable credentials, Horowitz performs a shameful hatchet job on her character, attacking her for opposing the Iraq War and for venerating her own father (of all things) and then accusing her of supporting Holocaust denial. He ends by lamenting the fact that Scott is not “a marginal individual in the academic profession” — as if such a brilliant and valuable scholar should be consigned to the rubbish heap of academia simply because Horowitz disagrees with her personal beliefs. Such words cannot help but have consequences, and in Horowitz’s case these personal attacks on prominent academics have resulted in the nearly complete exclusion of his ideas from scholarly consideration. Simply put, Horowitz appears to enjoy his role as provocateur more thoroughly than he takes seriously his role as academic critic. Any cause will necessarily become wrapped up with the character of its most prominent supporters, but in this case, I think Horowitz has helped his detractors to pigeonhole his arguments through personal attacks on him, just as surely as he afforded the same treatment to his rival Scott. I wish to make clear at this juncture that my goal is not to promulgate ad-hominem attacks on Horowitz, or to discredit his arguments by criticizing his tactics. On the contrary — I wish to show that Horowitz’s tactics themselves discredit his arguments to the people who are in positions of acting on them, and that he is poorly served by his emphasis on public pelt-hunting instead of focusing on the merits of the arguments themselves. While Horowitz himself has undoubtedly suffered at the hands of closed-minded professors and entrenched academic bureaucrats, such behavior can hardly be unexpected from a community that prides itself on being resistant to any change. Academics are programmed to be cantankerous about anything; a suggestion that the pipes be fixed in the history building will likely take as winding a road through academic bureaucracy as have Horowitz’s arguments. Where Horowitz goes wrong is in beginning the battle outside the academy, in the public and political spheres, instead of ending it there only when all more moderate tactics have failed; in doing so, he raises the hackles of all academics who rightly fear the specters of intellectual restriction he raises. Teachers who watch Horowitz trumpet the concerns of problem students all over the country are unlikely to take his arguments seriously; deans who watch him rally the public and politicians to pass laws limiting their power and freedom are likely to look askance at his arguments themselves; budding scholars who observe Horowitz’s attacks on hiring and tenure committees rightly fear for their future careers, whether guilty or not of classroom activism; academics who see their colleagues hounded and scapegoated by Horowitz and his posse are quite reasonable in their loathing of the man. The unfortunate irony is that, given enough time and a gentle touch on Horowitz’s part, nearly all of these people could have been allies of Horowitz in his crusade to reinvigorate and recenter liberal higher education in America. Were Horowitz to cease inveighing against individual academics and posturing against the academy in general, and instead use his considerable talents to work with professors in finding common ground, he might still find more bastions of support within academia than he has come to expect. 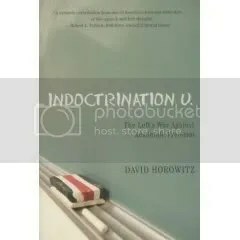 In the end, Indoctrination U falls short in its quest to render persuasive Horowitz’s concerns about the forced inculcation of radical views into today’s college students. But its very failure should serve as a challenge to some other holder of these views — or to Horowitz himself — to come up with a more balanced and reasoned volume laying out what to my mind are legitimate concerns. Such a volume would use individual cases only as examples; rather than seeking to dethrone or tarnish specific academics, it would suggest common ground with a majority of today’s professors, while moving the discussion in a constructive direction. Then, perhaps, we could finally have a meaningful debate on an issue that has seen, up till now, little but hot air. This entry was posted on Saturday, October 6th, 2007 at 8:37 pm and is filed under Uncategorized. You can follow any responses to this entry through the RSS 2.0 feed. Responses are currently closed, but you can trackback from your own site.